THE UST Archives houses a repository of countless documents, manuscripts and records of the country's oldest university. For many people, reading, collecting and maintaining dog-eared pages seem may be an impossible task taking years and years to accomplish. But Fr. Fidel Villarroel, O.P. continues to labor in the task of conserving and preserving the collection. He has served as UST's archivist for 47 years. He has grown old with the task, just like the archives. Yet, he sees his job as “the most beautiful thing” he has experienced in life. Villarroel is a self-confessed bookworm who loves to read and browse through antique documents– an unsurprising fact for a man who, early in life, had shown signs of becoming the keeper of memories past. Growing up in the town of Tejerina in Leon, Spain, Villarroel was inspired to become a priest by his high school teachers at the Dominican schools of La Mejorada and Santa Maria de Nieva. “It was during high school when I developed the vocation of being a Dominican priest. That was the only thing I thought of taking as I was contented to become like my Dominican professors someday,” Villarroel told the Varsitarian. While in high school, he became interested in studying grammar, language, Spanish history and literature. Although he had an inclination toward history, he did not consider becoming a historian since he was already focused on fulfilling his vocation to the priesthood. But destiny intervened for Villarroel. After he was ordained in 1953, he and his classmate were sent to London by his Dominican superiors to take up post-graduate studies in History. “I was sent away to England, for three years, to take up History at the University of London,” Villarroel said. After finishing his Master's degree in History in 1957, Villarroel was assigned to the Philippines to head the Spanish department of the University, a post he held for 22 years, from 1957 up to 1966, and then from 1968 until 1981. It was in UST that he obtained his doctorate in sacred theology. Villarroel was appointed archivist of the University in 1959. He said he was the first person to hold the post after a hiatus of six years when his predecessor, Fr. Jose Maria Gonzales, O.P., left the post in 1953. It was also during this time that Villarroel began to research and write about Philippine history. He was especially interested in Filipino patriots who studied in UST, such as Jose Rizal, Fr. Jose Burgos and Marcelo H. Del Pilar. “Since my arrival in the country in 1957, I always had the history of the Philippines in mind. Most of my books and my researches have been about Philippine history and also Church history,” Villarroel said. Villarroel has authored some 20 history books, most of which deal with the history of the University and the Philippines. Among them are Apolinario Mabini; Father Jose Burgos, University Student; Jose Rizal and the University of Santo Tomas; Lorenzo Ruiz, the Protomartyr of the Philippines and his Companions; and The Dominicans and the Philippine Revolution. His solid works in history have earned Villarroel national and international acclaim. Among the awards he received were the National Book Award, Catholic Authors Award, Dr. Eufronio Alip Award for Historical Research, Outstanding Thomasian Awardee for Historical Research, St. Antoninus of Florence Award for Humanities-Church History, and Gintong Aklat Award from the Book Development Association of the Philippines. Villarroel was also invited to speak at international conventions such as the International Conference on the Historiography of the Church in China held in Belgium (1991) and the International Seminar on Ferdinand Magellan (2004). Outside of UST, Father Villarroel enjoys a reputation as a masterful historian and scholar. Popular historian Ambeth Ocampo at one time wrote a column reporting how Father Villarroel exposed several historical errors in just one short paragraph by a Filipino historian. Researchers from other institutions also praised Father Villarroel for readily helping them in navigating through the labyrinth of the UST Archives and for his selfless assistance in their researches. Despite his genuine interest in history, Villarroel was confronted with a formidable task when he started working as UST archivist. According to him, the archives were in a state of disarray at the time of his appointment. “When I arrived here, the archives were located in a small room in front of the Fathers' Residence. It was unkempt, very dusty, disorganized and dark, with termites eating up some of the books,” he recounted. He and his staff then began to restore the archives by arranging the documents according to year and topic, maintaining the cleanliness of the facility, and increasing the number of sections of the archives. “Until now, I have been doing a lot of work in cleaning up the archives, putting it in order and increasing the number of our sections,” Villarroel said. Some of the tasks that keep Villarroel and his staff busy are cataloguing the archived documents and restoring damaged centuries-old records. “Many of the documents are breaking down in pieces, while some of the manuscripts are already unreadable, so they need restoration and preservation through chemical treatment,” he explained. Villarroel also started microfilming documents stored in the archives such as baptismal records coming from different parts of the country dating back to the Spanish era. 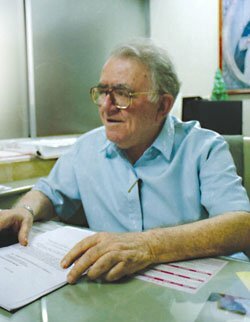 Aside from being the archivist and head of the old Spanish Department, Villarroel was also the Prefect of Libraries from 1978 to 1991 and adviser of the defunct Spanish student publication, La Voz Estudiantil, from 1957 to 1967. He has also been teaching Church History at the Faculty of Sacred Theology since 1963. Moreover, Villarroel was involved in activities outside of the University such as serving as the secretary of the Papal Nuncio for 32 years (1959-1991) and also as the Dominican Promoter of Beatification Causes, which aided the beatification of the seven Dominican martyrs of Nagasaki of the 17th century and perhaps most important, resulted in the canonization of San Lorenzo Ruiz, the first Filipino saint, and several of his companion martyrs who were alumni or teachers of UST. Despite his advanced years, Father Villarroel's heart remains close to historical research. His latest project is to write the last part of his planned three-volume history of the University. So far, he said, he has read about 700 pages of archived records from the 20th century that can help him finish the last part of his UST history. “That is a very meticulous task because I have to read all the archived records from the 20th century which I still have to write about,” Villarroel said. Despite all the pressure and strain of research, Villarroel said he enjoys his job as archivist. He added he takes particular joy that whenever he rediscovers long-lost information about the University. “Finding data and information about the past, which nobody has seen before, makes the discovery one of the happiest moments of my life, especially when it pertains to the history of UST,” he explained. Deriving intense pleasure from scholarship and research and love for any piece of history about Asia's oldest University, Father Villarroel vows to continue poring over the centuries-old documents stacked in the shelves of the archives, hoping to further save the memories of the University from dust and oblivion.